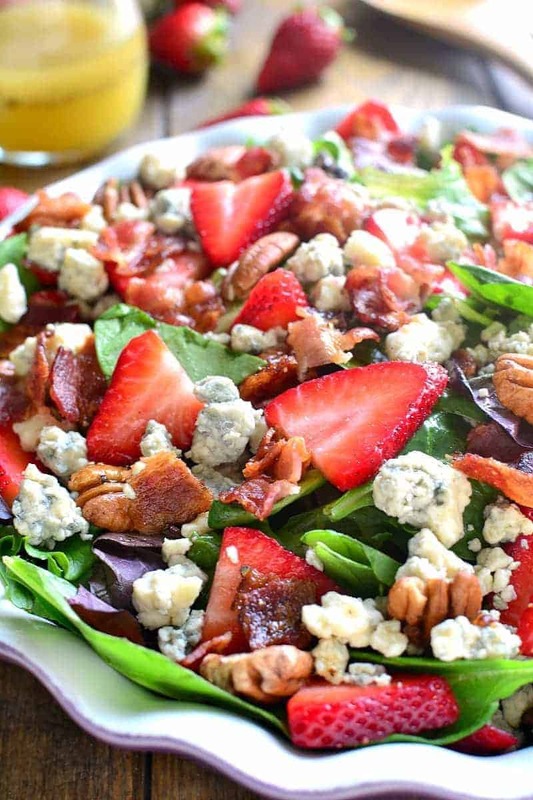 Strawberry Bacon Blue Cheese Salad is loaded with flavor and packed with crunch. 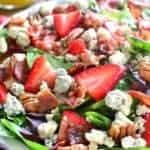 Perfect summer picnic salad recipe for pot lucks or an easy weeknight dinner…and just in time for strawberry season! 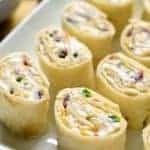 Can we talk for a minute about pot lucks? Because with summer quickly approaching, I’ve been thinking a lot about them. And about how much I LOVED them as a kid. And about how long it’s been since I’ve been to one! Now, I’m not talking about family get togethers, where everyone brings something to share. Because even though they technically could be considered pot lucks, they just don’t have that pot luck feel. You kinda know what you’re getting when your mom or sister or sister in law brings it, not to mention the meal has been planned in advance and everyone knows exactly what they’re responsible for. No, what I’m talking about is a pot LUCK! With those long buffet tables filled with crock pots, covered dishes, baking pans labeled with last names. 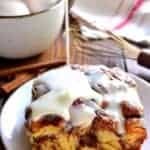 I’m talking about taking your chances on someone else’s chili or casserole, choosing between homemade frosted brownies vs. chocolate chip cookies. Hoping that what you really want isn’t all gone by the time you get through the line. It has me wondering: are pot lucks a thing of the past? Have they been replaced by pizza delivery and Qdoba bars? My childhood self hates to think this might be true. That means my kids might never experience a pot luck!? Sniff. Maybe I’ll plan my own. 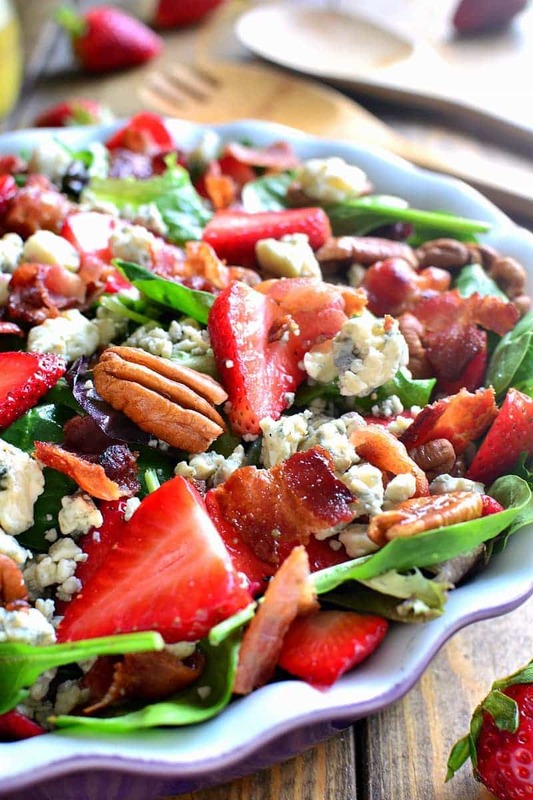 And if I do, I’m making this fresh strawberry salad! 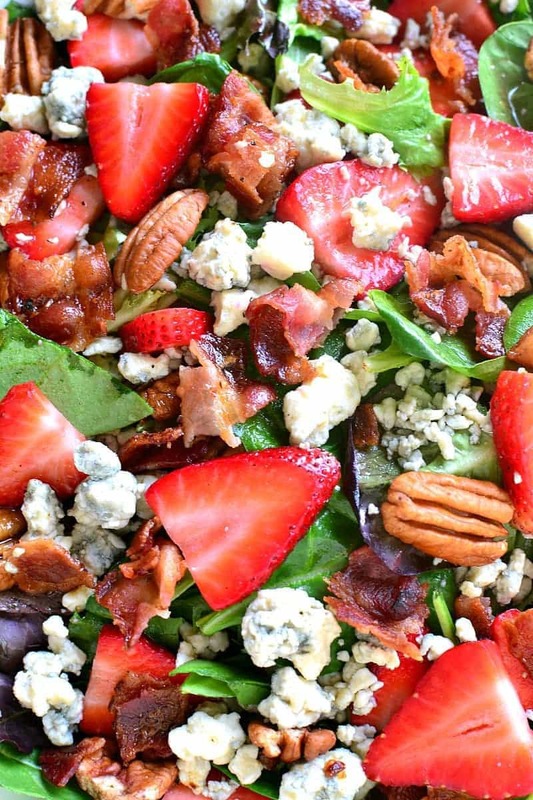 This Strawberry Bacon Blue Cheese Salad is loaded with flavor and packed with crunch. 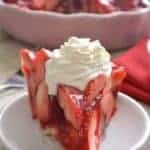 Perfect for summer picnics, pot lucks, or an easy weeknight dinner...and just in time for strawberry season! Prepare dressing by combining all ingredients and shaking until blended. Pour dressing over salad as desired. 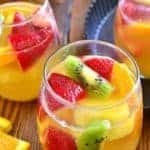 This looks delish😄😄. I’ll be making this !!! Oh how I miss pot lucks too! I haven’t been to one since I was a kid at church. 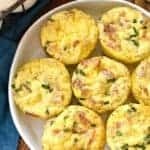 Whenever we had a church meeting or Sunday brunch they were pot luck style and you always hoped that really good hashbrown casserole and those frosted brownies were still there by the time you made it to the end of the table! 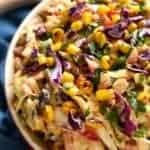 I feel if my husband actually ate salad, this would be the one! Seriously gorgeous and just incredible flavours! Oh, what a perfect blend of delicious flavors! Thank you for sharing!! 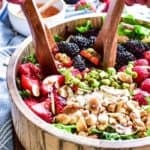 I totally agree – I hope potlucks aren’t a thing of the past?!?! Nah … it’s too much fun to have a potluck and get to try everyone else’s scrumptious creations … can’t be a thing of the past! 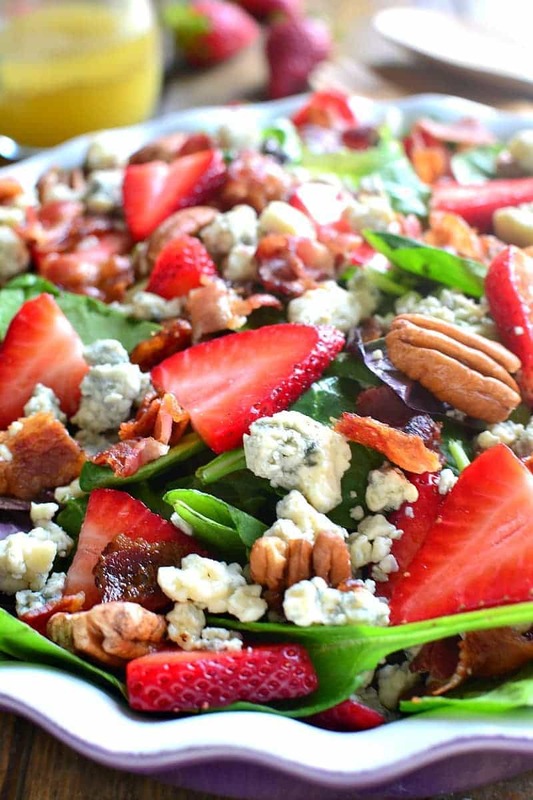 And wow – this salad would be the hit of the buffet! So gorgeous and just crammed full of big, delicious flavors! Wonderful! I love bacon and blue cheese! 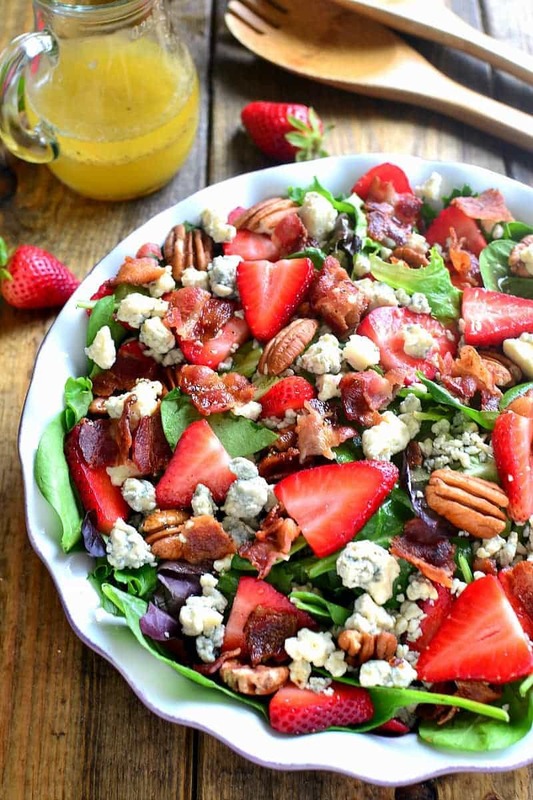 It’s the perfect combination with sweet strawberries on a salad! Oh my gosh this is my kind of salad. Sounds great! Can you tell me how many this recipe will feed? Thanks! 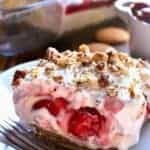 Thanks for this delicious recipe! I am using it for our church potluck which happens every Sunday after church! I would love it if you came to visit! 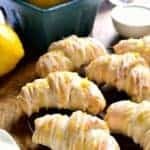 You could blog about the recipes you tried at our potluck! Hi Penny, I hope everyone enjoys it! 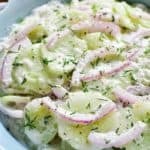 I am from Germany but your salads look super delicious so I have to try them. But I don’t undersand one thing: what do you mean by for example 5 oz. mixed greens? Going to take this to a potluck tonight. Thanks so much for the recipe. It looks so good that I want to lick the screen! How many servings does this recipe make? I need to make it for 15 people to be served with a main dish and some side dishes. Help!